Big Question on Snap: Can It Rebound? It's bad, but not unprecedented, reports the Los Angeles Times, noting Facebook stock fell 10% and Twitter stock fell 22% following the first quarterly earnings report after an IPO. Snap's user growth, it states, will be key to watch going forward. While Facebook rebounded from its 2012 hit, Snap faces a hurdle that Facebook didn't, an equity strategist tells CNBC: It has Facebook as a competitor. Indeed, the Stories feature on Instagram, which is owned by Facebook, has some 200 million daily users. Snapchat has 166 million. Spiegel seems flippant. "People are going to copy your product if you build great stuff," he said during Wednesday's conference call with investors. "Just because Yahoo has a search box doesn't make it Google." But that line raises a red flag for Peter Cohan, who says it's time to bet against Snap. 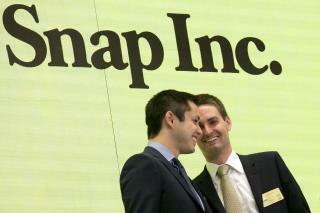 The company's "man-child CEO" is the "most frightening issue for investors in its shares," who "have no recourse but to pay the tuition for the CEO's on the job training," he writes at Forbes, also citing Snap's "undisciplined growth strategy." Nomura and Pivotal Research both appear concerned, expecting Snap stock to fall to $14 and $9 per share, respectively. But Goldman Sachs and Citi are more confident, with the former claiming "audience and engagement represent a unique asset that will benefit from growth and diversification of internet usage and advertiser adoption as both mature." I don't use Snapchat and likely never will. Yes, it'll rebound. Never underestimate the success of catering to the lowest common denominator.